Cypher Environmental Ltd. offers a range of unique environmental solutions that can be used for a variety of applications in environmentally sensitive areas. One recent example was a Dust Stop® application at the Pierre Elliot Trudeau International Airport in Montréal, QC, Canada. Dust Stop® has been applied to Route 500 at the airport two years in a row, in 2014 and 2015. It was an ideal solution for the airport due to the need to use a non-corrosive and environmentally friendly product. The non-corrosive factor was an extremely important qualifying necessity for the airport. Corrosive materials are not allowed on the premises because of the sensitivity of airplanes that regularly travel through the airport. Route 500 is located only 500 feet from a major runway which is the minimum legal distance for an unpaved road to be adjacent to a runway. Therefore, the need to find an effective dust control solution was high on the airport’s agenda. This ensures the dust does not migrate onto the runway causing visibility and safety issues, potentially causing delays. 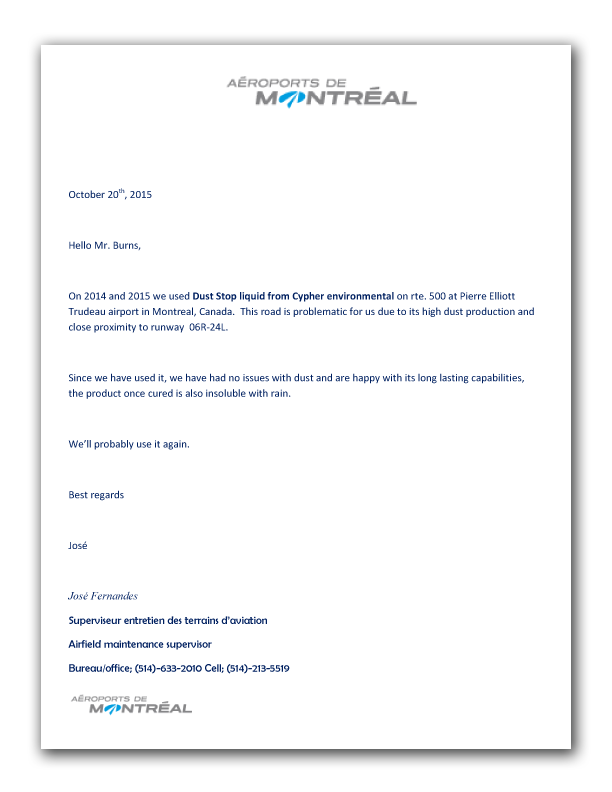 Below is a reference letter from the airport, discussing the benefits and positive experiences with Dust Stop®’s applications. While the airport’s primary target using Dust Stop® was road dust control, they have seen a number of other benefits to the road. This includes improved engineering properties of the wearing course, allowing for significant reductions in any maintenance requirements and costs.